Hematite nanoflakes have been synthesized by a simple heat oxide method and further treated by Argon plasmas. The effects of Argon plasma on the morphology and crystal structures of nanoflakes were investigated. Significant enhancement of field-induced electron emission from the plasma-treated nanoflakes was observed. 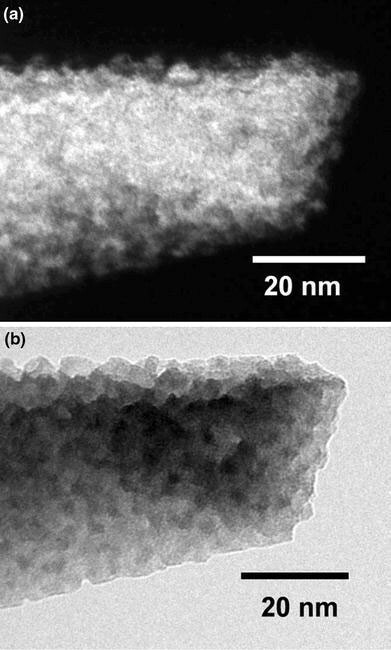 The transmission electron microscopy investigation shows that the plasma treatment effectively removes amorphous coating and creates plenty of sub-tips at the surface of the nanoflakes, which are believed to contribute the enhancement of emission. This work suggests that plasma treatment technique could be a direct means to improve field-emission properties of nanostructures. 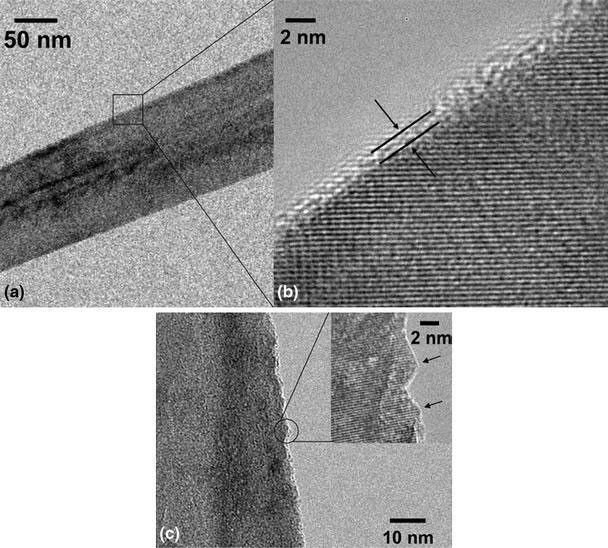 One-dimensional (1-D) and quasi–1-D nanostructures, due to their high crystal quality, large aspect ratio and sharp tips are well known as promising candidates for applications related to cold cathode, field emission of electrons . Field emission—also called Fowler–Nordheim tunneling —is a form of quantum tunneling in which electrons pass through a barrier in the presence of a high electric field. This phenomenon is highly dependent on both the structural properties of materials and the shape of particular cathode. Practically, high current density and low turn-on field are the most desirable properties for electron emitters. For given materials, field-emission properties are mainly dependent on the morphologies like dimension and apex geometry of 1-D and quasi–1-D nanostructures. To improve the field-emission properties of nanostructures, several methods were employed before and after the synthesis process, for example, increasing the carrier concentration by a heavily ion doping method  or modifying the apex geometry by gas plasma treatment . Recently, experiments have shown that emission current density of carbon nanotubes could be effectively enhanced by plasma treatments, which are capable of functionalizing and modifying the surface structure of carbon nanotubes . In addition to carbon nanotubes, gas plasmas like H2, Ar , O2, and CF4 have also been adopted to modify other nanomaterials. The results demonstrate plasma treatment could be a simple and efficient method to improve the field-emission performance of nanostructures. Argon (Ar) plasma is one kind of clean and non-toxic gas plasmas, which can be widely used in research and industry field. However, the effect and mechanism of Ar plasma treatment for the field-emission properties of metal oxide nanostructures have rarely been addressed in the literatures , although there are a plenty of publications in the field of carbon nanotubes [9, 10]. Hematite (α-Fe2O3) is one of the most important magnetic materials and shows numerous potential applications, such as the active component of gas sensors , photocatalyst , Lithium ion battery , and enzyme immunoassay . The α-Fe2O3 nanoflakes grown atomic force microscope (AFM) tips  exhibit promising electron field emission properties at first time. Our previous works have demonstrated that α-Fe2O3 nanoflakes could be one of the promising candidates as future field-emission electron sources and displays (FEDs) . In this work, we report the effects of Ar plasma treatment on the crystal structure and morphology of α-Fe2O3 nanoflakes. The field-emission properties of the plasma-treated α-Fe2O3 nanoflake film were also investigated. The α-Fe2O3 nanoflakes were synthesized by heating Fe foil on a conventional hot plate at atmosphere environment, as described in our previous work [16, 17]. The growth temperature and duration were fixed at 260 °C and 15 h respectively. The plasma treatment was conducted by a plasma etching system (March PX-250) under the following conditions: radio-frequency (RF) frequency of 13.56 MHz, flow rate of 20 sccm, operating pressure of 0.2 Torr, RF power of 100 W, and process duration of 10 min. The morphologies of the as-prepared and plasma-treated products were examined by scanning electron microscopy (SEM) (JEOL JSM-6700F) while the compositions of their top surface were characterized by X-ray diffraction (XRD) (Bruker D8 with Cu Kα irradiation) and micro-Raman spectroscopy (Witech CRM200, λlaser = 532 nm). The transmission electron microscopy (TEM) (JEOL JEM 2010F, 200 kV) observation shows the detailed morphology and crystal structure of the ultra-sharp nanoflakes. Field-emission measurements were carried out in a vacuum chamber with a pressure of 3.8 × 10−7 Torr at room temperature under a two-parallel-plate configuration. Details of the measurement system and procedure were reported previously . The distance between electrodes was kept at 100 μm with a measured emission area of 280 mm2. Figure 1shows the SEM image of the as-prepared sample obtained. The random aligned nanoflakes synthesized at this temperature are about 20 nm at the bases, 5 nm as the radius of the tips, and 1–2 μm in length in general. From the high magnification SEM image inset of Fig. 1, it can be clearly seen that there are semispherical tips at the thin ends of the nanoflakes. Figure 2a illustrates the XRD patterns of the as-prepared sample and the plasma-treated sample. The rhombohedral α-Fe2O3 with lattice constants a = 5.035 Å and c = 13.749 Å are readily conformed from the XRD pattern . The dominant diffraction peak form the (110) planes in our XRD pattern results from the (110) growth direction of the α-Fe2O3 nanoflakes . The XRD pattern reveals a universal narrowing of peak width for the plasma-treated samples, which exhibits that the overall crystal quality of the nanoflakes might be improved by the plasma treatment. The Raman spectra of these film samples are shown in Fig. 2b. In the range of 150–550 cm−1, there are five peaks located at 225, 245, 291, 408, and 499 cm−1 corresponding to the α-Fe2O3 phase , namely two A1g modes (225 and 499 cm−1) and three Eg modes (245, 291, and 408 cm−1). The same as the XRD pattern, no new peaks appear in the Raman spectrum of the plasma-treated sample, which indicates that the Ar plasma treatment did not introduce any new phase into the original α-Fe2O3 nanoflakes. After Ar plasma treatment, some of the peaks (245, 291, and 408 cm−1) become relatively weaker, which may be due to the surface defects on the nanoflakes coming from the plasma treated. 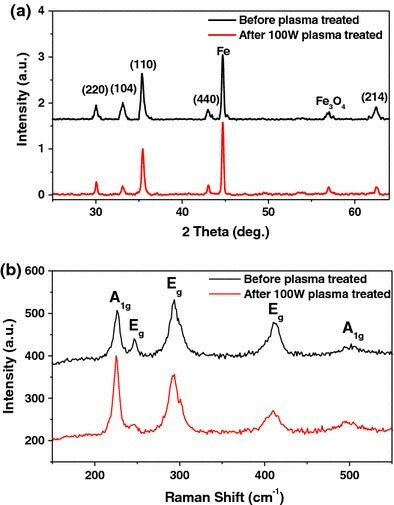 However, the peak position did not shift at all after plasma treatment demonstrating that this kind of plasma treatment did not affect the degree of crystalline perfection in α-Fe2O3 nanoflakes significantly. The XRD patterns and Raman spectra can be only used to illustrate the influence of the plasma treatment on total film samples. The detailed effects of the plasma treatment on the α-Fe2O3 nanoflakes surface structures need to be further confirmed by other characterization methods. To further reveal the influence of the Ar plasma treatment on the structure of the surface and interior of the nanoflakes at an atomic level, TEM was employed. Figure 3displays the representative TEM images of α-Fe2O3nanoflakes before and after Ar plasma treatment for 10 min. As can be seen in the high-resolution TEM (HRTEM) image (Fig. 3b) of the region highlighted by a square in Fig. 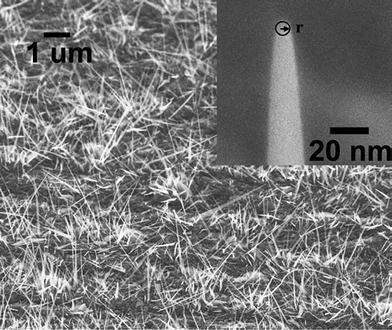 3a, a very thin amorphous layer covers the surface of the as-grown nanoflakes, which is shown between two solid black lines. A typical low-magnification TEM image of the plasma-treated nanoflakes is shown in Fig. 3c. It is obvious that the amorphous layer was totally removed by Ar plasma and the nanoflakes became atomic scale clean. More importantly, plenty of surface protrusions as indicated by the arrows were formed by plasma treatment (Inset of Fig. 3c). The extension of the crystal lattice readily demonstrates that such protrusions of 1–3 nm in size are epitaxially connected with the original round tip body. Considering the above-mentioned XRD, Raman, and TEM results, the main effect of Ar plasma in this work is removing the amorphous layer and creating nano protrusions. The projected structure can be seen through a bright-field TEM image of one α-Fe2O3nanoflake. (Fig. 4a) The corresponding dark-field TEM further confirms the existence of the protrusions on the surface of plasma-treated nanoflakes (Fig. 4b). 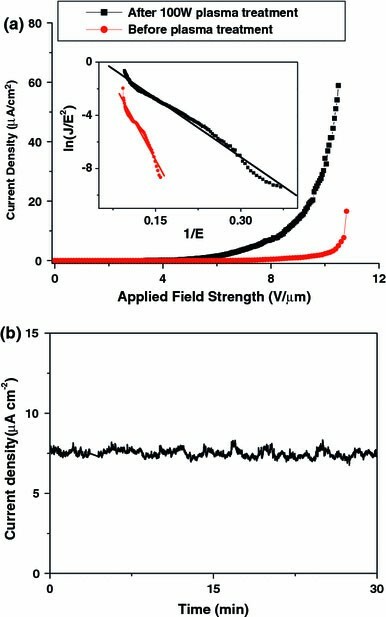 β is a parameter depending on the aspect ratio of the nanostructures, crystal structures, and the density of the emitting points; d is the average spacing between the electrodes (d = 100 μm in this work) and V is the applied voltage. β was obtained to be 1,131 from the linear fitting of the F–N curve at turn-on area while that of Ar plasma-treated nanoflakes was 3,218. This enhanced factor β is higher or comparable to many other nanostructures, such as the AlN nanoneedles (β = 748)  and the ZnO nanopins  (β = 2317). The field-emission stability of the plasma-treated α-Fe2O3 nanoflake films was investigated and the typical result is shown in Fig. 5b. The total emission current was monitored over 30 min under an applied macroscopic field of 9 V μm−1 and an emitter–anode gap of 100 μm. At an emission current density of ~7 μA cm−2, the fluctuations were <5% and no degradations were observed. Comparing with our previous results , it is believed that the Ar plasma treatment will not only improve the current density but also extend the stability of the field-emission current. These results reveal the possibility of Ar plasma treatment to improve the field-emission performance. Based on the morphological and crystal structural investigations, the enhancement of field emission by Ar plasma treatment could be elucidated. First, the plasma etching process effectively removes the amorphous coating and cleans the nanoflakes at atomic level. Second, ultra-sharp sub-tips of 1–3 nm could be created by the plasma treatment which can remarkable reduce the diameter of the emitter for increasing the field enhancement factor . At last, the density of emitters is significantly increased. All these effects could enhance the factor β and consequently improve the emission performance. In summary, the effects of Argon plasmas on the morphology and crystal structures of α-Fe2O3nanoflakes were investigated. Our results successfully demonstrate that the plasma treatment could effectively clean the nanoflakes, create plenty of ultra-sharp sub-tips and consequently significantly enhance the electron emission from plasma-treated nanoflakes. The high current density and low turn-on field promise a potential for plasma-treated α-Fe2O3nanoflakes as electron emitter. This work also demonstrates the plasma etching process might be a facile and efficient technique for improving electron emission of nanostructures.